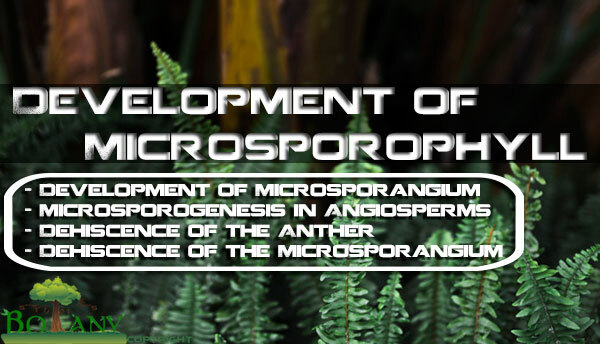 Development of microsporophyll involves the arise of stamen as a small papillate outgrowth of meristematic tissue from the growing tip of floral primordium. 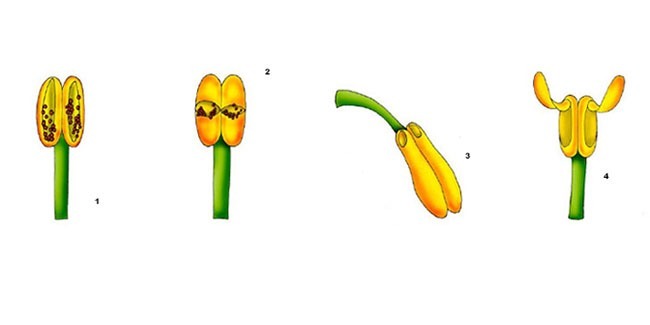 It grows actively and is differentiated into an apical border portion, the anther and a lower slender part, the Filament. The transverse section of a very young anther shows that it consists of a mass of meristematic cells surrounded by an epidermal layer. In each lobe, a group of hypodermal cells becomes differentiated from the surrounding cells by enlarging in size, having dense cytoplasm and prominent nuclei. These are the sporangia! Initials which generally consists of a two to three cells wide plate reopening along the entire length of the lobe. These cells divide forming a Primary Parietal Layer lie beneath the epidermis and by periclinal and anticlinal divisions give rise to 3-5 concentric layers of cells forming the wall of the anther. The outermost parietal layer lying next to epidermis constitutes the Endothecium. The cells of endothecium develop fibrous bands of thickenings and assist in the dehiscence of anther on maturity, at appoint called Stomium, where the endothecium is thin walled. The innermost layer of parietal tissue develops into a single-layered Tapetum. The cells of the tapetal layer are radially elongated, wedge-shaped and have dense cytoplasm and prominent nuclei. In between the endothecium & tapetum, 1-3 layers of cells are present. The cells of primary sporogenous layer divide mitotically and give rise to Microspore Mother Cells. 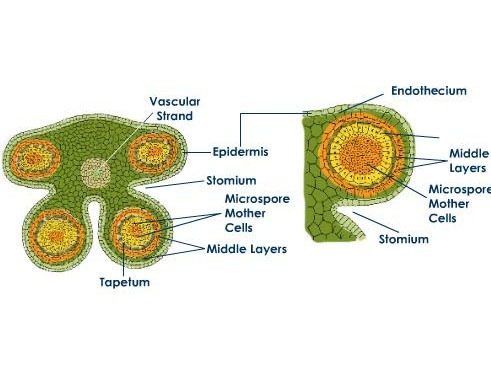 In the beginning the microspore mother cells are closely packed but as the anther enlarges in size, the pollen sacs also increase in size, these cells enlarge in size, become spherical in shape and get loosely arranged. In many cases, some of the spore mother cells are non-functional and act as a food for the rest of the cells. 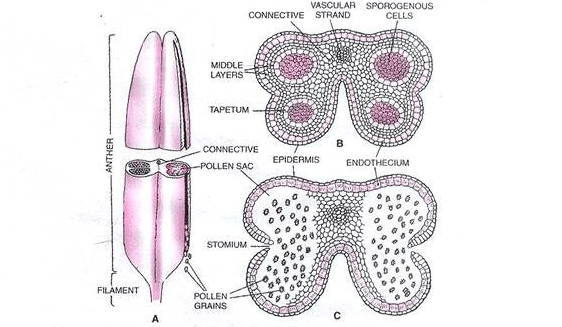 Each microspore mother cell produces four Microspores or Pollen Grains. 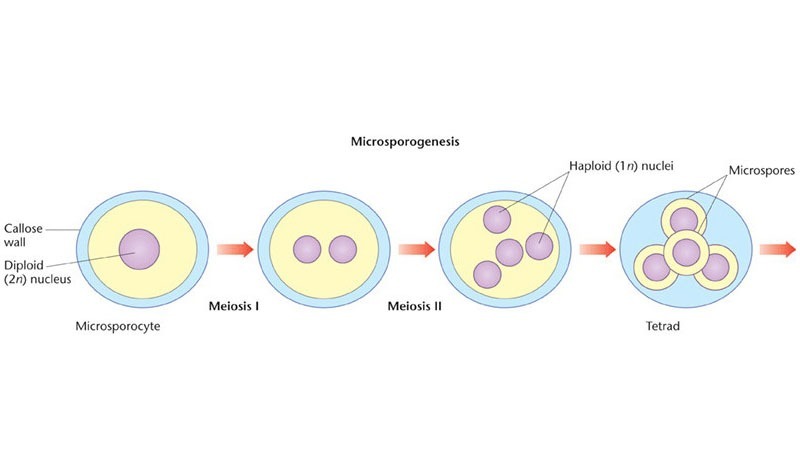 The nucleus of each spore mother cell divides twice to form four nuclei, the first division being reductional (Meiosis I) and the second being the ordinary mitotic one (Meiosis II). The nuclei are haploid. The original wall of the microspore mother cell becomes mucilaginous during the formation of the microspore, and a new “wall is formed around each newly formed pollen grain. In most of the dicots, the wall formation is Simultaneous Type, i.e., the nucleus of the spore mother cell divides twice forming for haploid nuclei, and the walls are laid down between the four nuclei simultaneously by furrowing method. The four daughter cells are arranged in a tetrahedral manner forming a Tetrad. Porous: The dehiscence take place through pores, e.g., in Solanum. Valvular: The dehiscence take place by one or more valves, like the shutter of a window, which open on the outer side only, as in Berberris. When the anther is mature, the middle layers and the tapetum disorganize. The sporangia! wall now consists of epidermis and endothecium. The sterile partition between the two pollen sacs disintegrate and two pollen sacs of one side unite together forming a single compartment. 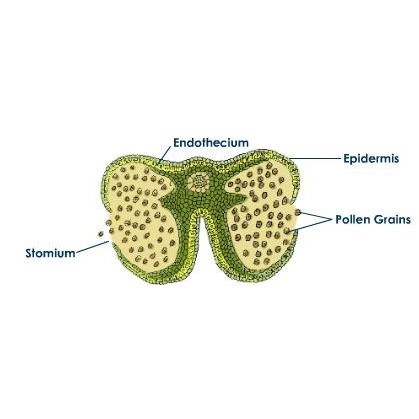 The pollen grains are released through stomium, generally.